Summary: Over the past five years, the Sea Turtle Conservancy and the University of Central Florida have partnered to satellite track the migration of loggerhead sea turtles from the Carr Refuge. The results of this tracking has been utilized for both research (Ceriani et al., 2012) and in STC’s educational outreach program, the Tour de Turtles. Tour de Turtles, started in 2008, is an incredibly successful endeavor to increase public awareness and understanding about the threats facing Florida’s sea turtles and their habitats. The Tour de Turtles is an online education program based upon presenting near real-time satellite tracking of sea turtle migrations from nesting beaches to adult resident habitats in a fun and interesting free package. Since the launch of STC’s original online tracking educational program in 1996, millions of people have visited STC’s website to follow the satellite tracked movements of sea turtles. This project will continue STC’s Tour de Turtles Educational Program through 1) developing new lesson plans for the Elementary, Middle and High School levels based upon satellite tracking and issues related to Florida’s sea turtles and habitats; 2) working with the University of Central Florida to deploy satellite transmitters on four post-nesting adult loggerhead and/or green sea turtles in and around the Carr Refuge as part of the 2013 Tour de Turtles; and 3) developing new educational multimedia material for the Tour de Turtles website. To enhance local excitement and media coverage of the program, STC will coordinate two live “starting” events around the release satellite-tagged sea turtles. 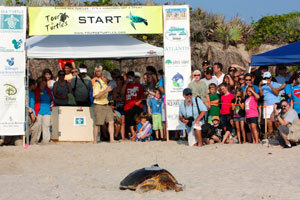 These releases have been attended each year by over a thousand spectators and include sea turtle educational activities, such as a crawl-through TED, sea turtle research station, and mock oil clean-up station. Tour de Turtles will be promoted by targeting previously-registered educators, schools and educational associations via emails, websites, social media, and through program partners, such as Disney’s Animal Programs. Results: STC has completed all tasks. Over the weekend of July 27/28, four post-nesting loggerheads were attached with satellite transmitters and released at two separate public release events. Due to permit restrictions, ATVs were not used for the project, instead the Field Equipment line item is being used to purchase a beach cart that can be used to safely move the turtle and holding box safely on the beach. The outreach benefits of this project are shown by the number of visitors to the Tour de Turtles and STC websites, as well as the turnout and coverage of the live release events. As of the date of this report, all four post-nesting loggerheads have been tracked for over 194 days, and three of the turtles continue to be tracked. Three of the four loggerheads migrated southeast to feeding areas in the southern Bahamas, the fourth migrated around Key West, FL to a feeding area 1 - 3 km southeast of Lovers Key State Park, FL. The Tour de Turtles site (from mid-July to mid Nov, 2013) had a reach of over 20,000 visitors and nearly 100,000 page views. The two live releases of the post-nesting female loggerheads were very well attended; over 1,000 people attended the events, providing the opportunity to increase awareness about sea turtles, their habitats and threats to their survival. People at the live releases are able to follow the migration of the turtles online and continue learning through a direct connection with the turtles. The loggerheads that were released with satellite tags helped to raise awareness about the threats of artificial beach front lighting, water quality, plastic bags and balloons, and coastal erosion. A total of six new educational lesson plans were developed utilizing the satellite tracking and sea turtle threat information on the Tour de Turtles website. Lessons included A Brief Unit on Sea Turtles (Elementary School Grades 2 & 3), Plotting and Prediction: Track Sea Turtles and Predict Their Routes (Elementary School Grade 5, Easily adapted for Middle and High School), Cause and Effect - Human Impact on Sea Turtle Populations: Plastic Bags (Elementary School Grades 5 – 8), Who Cares for These Turtles? (Middle and High School Grades 6 – 12), Tides of Change... (High School Grades 10 – 12, Can be adapted for upper Elementary and Middle School), and Tour de Turtles: It's a Race for Survival! (Middle School Grades 6 – 8). A sea turtle adventure game was developed by MeGotta, Inc and has been uploaded to the Tour de Turtles and Sea Turtle Conservancy websites. The game, which will be heavily promoted during the upcoming 2014 Tour de Turtles, involves a hatchling making its way across a beach filled with different threats, from crabs to sea gulls to trash and holes in the sand.